Measuring blood pressure is stressful for some, but Leman Micro Devices says let your phone do it, not your doctor. This Swiss electronics company is on a mission: to stop millions of people dying of ignorance each year. Worldwide, high blood pressure leads to around 9.4 million deaths annually according to figures from the World Health Organization. And yet, the condition is easily diagnosed and treated. In the Americas, the prevalence of high blood pressure fell from 31 percent in 1980 to 18 percent in 2014, but remains high in developing countries. Before high blood pressure can be controlled, though, it needs to be detected, and that’s the part that Leman Micro Devices wants to make simpler. It is showing off its solution at Mobile World Congress in Barcelona this week. Measuring blood pressure usually requires a bulky and inflatable cuff that fits around the upper arm, squeezing it till it stops the flow of blood in the artery then releasing it until the flow starts again. Some cuffs can automatically detect the stop and start and record the pressure at each point; others require the medical practitioner to listen to the blood flow using a stethoscope and record the pressure manually. The arm isn’t the only part of the body where an artery is accessible enough for the measurement of blood pressure, though: There’s one in the index finger, on the side of the middle phalanx nearest the middle finger. 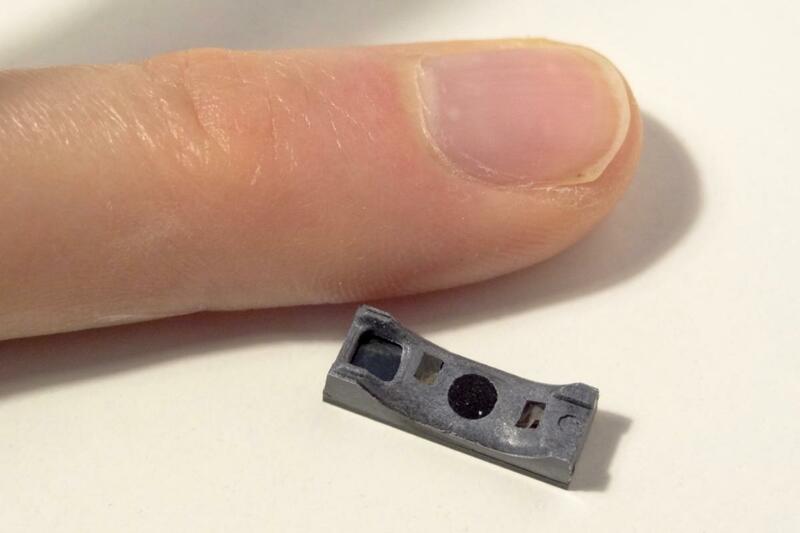 Depending on how you hold your smartphone, you might already be in the habit of pressing this part of your finger on the top, which is exactly where Leman Micro Devices wants phone makers to install its tiny package of chips and sensors. In that position, the package can measure blood pressure using a pressure sensor covered by a flexible pad a few millimeters across. And it can tell when the blood flow stops and starts because the package also contains infrared emitters and receivers that allow it to measure pulse rate and blood oxygen level. With a little mathematical wizardry, it’s also possible to calculate when someone takes a breath from cyclic variation in blood pressure, according to LMD CEO Mark-Eric Jones, and the package also includes an infrared thermometer for contactless temperature measurement, meaning it can measure five vital signs in all. One advantage of the small sensor is that it can be used throughout the day, far from the doctor’s office, which means more accurate blood pressure measurements for those susceptible to “white-coat hypertension,” a curious phenomenon that affects around one person in three. Named for the white coats that doctors traditionally wear in many western countries, it describes how some patients’ blood pressure will rise as they become nervous at the prospect of a visit to the doctor. It can be exacerbated by the discomfort or pain sometimes associated with the measurement cuff. LMD’s sensor is pain-free, and the measurement process involves playing a simple game on the associated smartphone app, the distraction of which can also relax patients, said Jones. To take the measurement, patients must slide a bucket from side to side to catch a series of falling balls. To control the bucket, they must vary the pressure exerted on the sensor, unwittingly going through the full range of pressures required to stop and start the flow of blood in the artery. An approximate measurement can be obtained in about 30 seconds, a medically accurate one takes about a minute, according to Jones. The device is undergoing clinical trials in Switzerland, he said. Because it relies on the same physical principals that have served to measure blood pressure for the last 120 years, and because the testing process for blood pressure measuring devices is standardized internationally—even down to the format in which the results must be presented—Jones expects few difficulties in getting to market. The company is seeking approvals in 14 regulatory regions (the European Union is one, the U.S. another) covering 97 percent of the world smartphone market, he said. The approvals should begin arriving in the second half of this year, with phones containing the sensors on the market a year later, he said. To maximize the accuracy of the device and simplify its production, LMD came up with an interesting way to get around manufacturing variations in the “color” of the two infrared LEDs it uses in the blood oximeter. It calibrates them in the factory, recording the peak wavelength to within 1 nanometer, and storing that in a database alongside the serial number burned into each device. When the measurement app is run for the first time it reads the serial number of the sensor and sends it to LMD’s servers, which return the calibration profile and allows the app to make accurate measurements. The company could, instead, have bought infrared LEDs with more tightly specified wavelengths to avoid the need for calibration but that, said Jones, would have cost ten times as much. Choosing when, and how, to take certain measurements can have dramatic consequences—in manufacturing and in health.